Book of Aztec is without a doubt Amatic’s most popular slot. This video slot with 10 paylines and a payout rate of 96% is a bonafide copy of Novomatic’s famous Book of Ra slot. The Book of Ra is not available to play online everywhere, and it is no secret that a lot of other providers are trying to pick up a bit of the action by playing on the name recognition of Book of Ra. 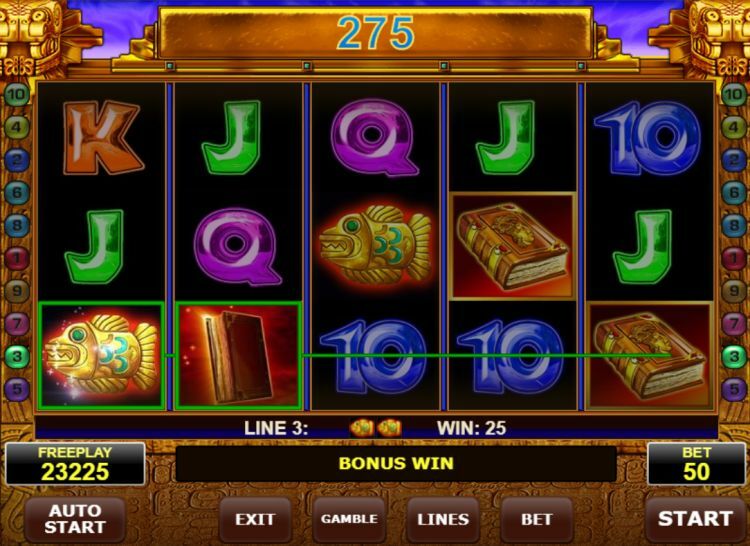 The Book of… slots are in high demand, and almost every game provider has its own version. Think of Book of Dead by Play’n Go or Book of Gods by Big Time Gaming. This Book of Aztec is also doing very well in the online casinos, and despite the fact it looks a bit rough around the edges (and sounds like it too) it is an excellent slot. 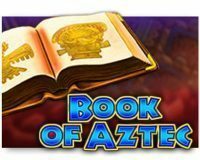 How does the Book of Aztec slot work? The gaming mechanism will be familiar: there are 10 fixed paylines, and the game is played on 5 reels with 3 rows of symbols. The minimum bet is $€ 0.10, while the maximum bet is $€ 10, per spin. The latter makes especially online casinos happy as Book of Aztec can pay out extraordinary amounts of money. In the bonus round, you can rake in 5,000 times the stake per spin. It should not come as a surprise then that Book of Aztec is a high variance slot. 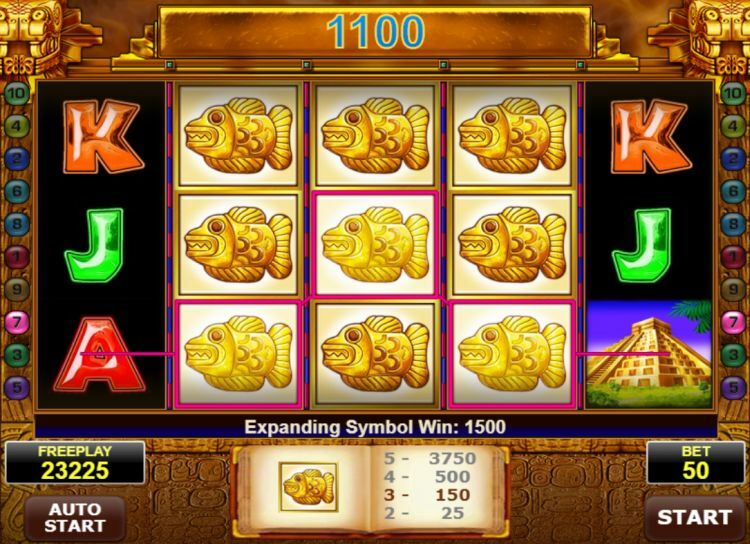 The theme of this slot encompasses Aztecs, explorers and gold. In this particular case, the lead character is a lady, and that is refreshing. 5 ladies on an active payline are good for 5,000 coins. The pyramids bring in 2,000 coins with every 5-of-a-kind, and the golden artefacts have a value of 750 coins. The card symbols clearly serve as filler in the primary game and pay out between 100 and 150 coins when there are 5 identical ones on an active payline. The Book of Aztec symbol is wild and replaces all other symbols. 3 or more Book of Aztec symbols activate the free spin bonus. You win 10 free spins that can be retriggered without limits. But before you start the bonus round, you can determine a special symbol. This will always be picked among the symbols from the primary game, but it can’t be the wild symbol. When this special symbol lands on the reels during the free spin bonus, it expands, and the paylines become scattered. It no longer matters where on the reels the symbols drop. Is the female Indiana Jones your special symbol and 5 of them land scattered on the reels? You have just won the biggest prize in the game: 10 x 5,000 coins = 50,000 coins! Not bad. 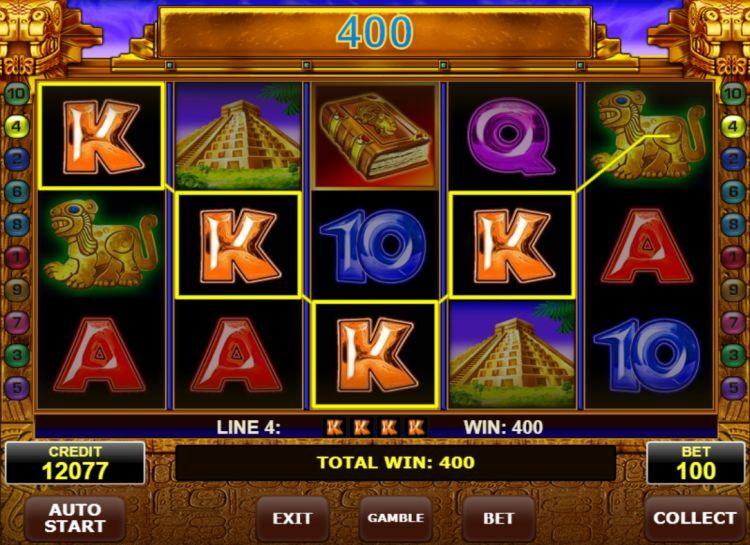 A screen full of pyramids also drops a ton of cash in your lap: 20,000 coins. Even a screen full of aces can still deliver a cool 1,500 coins. You get that this bonus feature can be enormously lucrative and that it is the biggest draw of this slot. There are dozens of Book of Ra clones out there in online casinos, but this is definitely one of the better ones. Although the graphics are nothing special, the game keeps an up-tempo pace, and the bonus rounds come by nice and frequent. The payout rate of 96% is A-Okay, especially when you keep in mind that this rate at land-based casinos is several percentage points lower. Where can you find the Book of Aztec? The Book of Aztec slot is found at all reliable Amatic casinos. One of these Amatic casinos is Slots Million, which is one of our favourite online casinos. You can play the Book of Aztec slot at Slots Million with a 100% bonus up to $€ 100 plus 100 free spins.